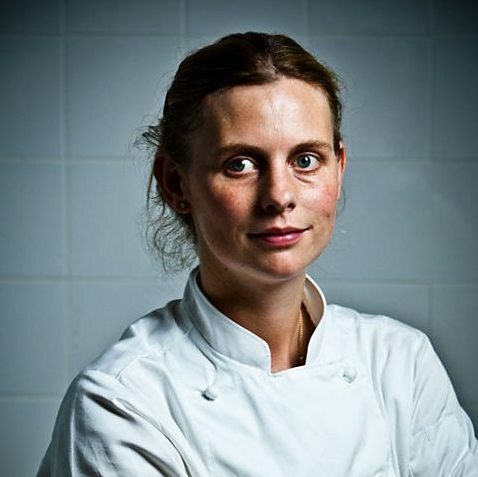 We are delighted to welcome back Emily Watkins for this hands on masterclass where she will guide you through a menu of the multi award winning modern British food that she served at The Kingham Plough in Chipping Norton. Under Emily’s expert and patient tuition, you will cook some of the dishes for which The Kingham Plough has become renowned. On her last class we cooked Cornish Mackerel Burger with beetroot muffin, blood orange and beetroot chutney and chicory and orange salad; Pork tenderloin Wellington with Grandpa’s Cabbage and Rhubarb and Custard (Baked custard, poached rhubarb and rhubarb ice cream). Expect more seasonal dishes from one of the stars of the UK restaurant scene. Joining the ranks of an elite few female chefs who hold their own in the male dominated world of restaurants, Emily was chef proprietor of the Kingham Plough in Chipping Norton. Emily is a familiar face on TV having appeared in two series of Great British Menu – in 2014 her dish won the fish category and she cooked it at a banquet celebrating the 70th anniversary of the D-Day landings. She has also featured on Tom Kerridge’s Proper Pub Food and The Hairy Bikers. Emily spent two years in Florence gaining a classical training in the kitchens of Ristorante Beccofino. She then worked with Heston Blumenthal at The Fat Duck and combined these two radically different approaches in developing her own style whilst working as a private chef in London. She opened The Kingham Plough with her husband in 2007. The pub is recommended in both the Michelin and AA Guides and is Oxfordshire Dining Pub of the Year in the Good Pub Guide 2015 and is listed in The Times 25 Best Country Pubs for Food.